Orders received by 2:30pm EDT will process the same day. 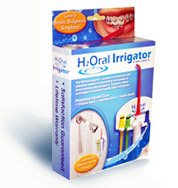 Order your H2Oral Irrigator today for you and your whole family to use! The kit comes with four colored picks. Order extra picks to replace old picks.